If you’re looking for a big, opaque, nearly-purple California Cab with big bubbles and the heady aroma of oak, cola, and deep dark fruits, this isn’t it. The Gen5 isn’t a typical Cab at all. That said, every once in a while a wine comes along that knocks my socks off. It doesn’t happen often. I live in a rural area where tastings are few and far between. This blog and the associated learning experiences are a labor of love, done as a sideline and out of tremendous curiosity as a result of falling in love with wine for the second time in my life, on my birthday in 2010. (The first time was in the early ’80s, with the big Napa wines of that era.) In fact, on that auspicious evening, I fell in love with not one but two wines: 2007 J.L. Chave “Mon Coeur” Côtes du Rhône, and 2009 Whitehaven Sauvignon Blanc. When that occasional wine overcomes my heart and senses with its beauty, it reminds me of what it feels like to savor the best kisses on the planet (Thank you, Clark). After the wonders that accompany being in love, next on the list of my favorite sensations on earth is déjà vu—that unearthly, rich, vertigo-like impression of “what is this again? what IS this? where, when, whaaaaa?” A couple of déjà vu experiences have ended up influencing the rest of my life: once with a scent (Shalimar, which I wore exclusively for 20 years, and often wear to this day) and once with a mind-bending flavor: truffles. To my amazement, this $12 California Cabernet (actually a blend) evoked déjà vu yet again, because in its essence from start to the very long finish, I experienced TRUFFLES. The earthy, buttery, mysterious yet bright, amazing, unmistakably excellent taste of TRUFFLES. Oh. My. Word. How do they DO that? Maybe it’s a combination of the Bordeaux style of winemaking, and aging in French barrels. I don’t care. So far, this is my Wine of the Year. Although not a typical Cab, it was very interesting and gave me a delicious, engaging, and new experience. TASTE: … an explosion mid-tongue of TRUFFLES. Just exquisite. The French oak aging brought the expected tightness to the structure. With a little caramel, black cherry, cola, and pipe tobacco, faint threads of the Cab were evident, but heavy-handed they were not. FINISH: Truffles were on the very long finish, too, and the tannins bode well for this delicious, chewy wine to cellar well. Quite frankly I wouldn’t recommend pairing this wine with anything—enjoy it by itself. 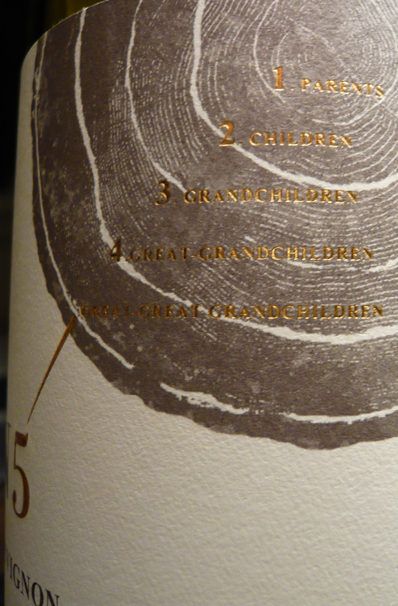 The tree rings on the upper right of the label designate years and generations: Parents at the top, followed by children, grandchildren, great-grandchildren, and great-great-grandchildren. Gen5 is a joint venture between LangeTwins Winery and Vino del Sol. Description: We strive for a friendly Cabernet Sauvignon, with juicy red and black fruit flavors that is well-balanced and textured and soft on the palate. Climate: Classic Mediterranean. Lodi takes advantage of the gap between the northern and southern coastal ranges surrounding the San Francisco Bay. As the day’s temperature rises, cool breezes drift in from the Delta, keeping the nights cool which is ideal for the development of complexity in finished wines. Soils: Well-drained rich mineral soils, sandy to clay loam. Varietals: 85% Cabernet Sauvignon; 8% Merlot; 4% Petit Verdot; 3% Malbec. Winemaking: Grapes are fermented 12 days at 84F. Wine undergoes extended maceration on skins up to 30 days to maximize varietal expression. Aging: 12 months with French (80%) and American (20%) oak. This entry was posted in Cabernet Sauvignon, California, Malbec, Merlot, Petit Verdot. Bookmark the permalink. 4 Responses to HIGHLY RECOMMENDED. 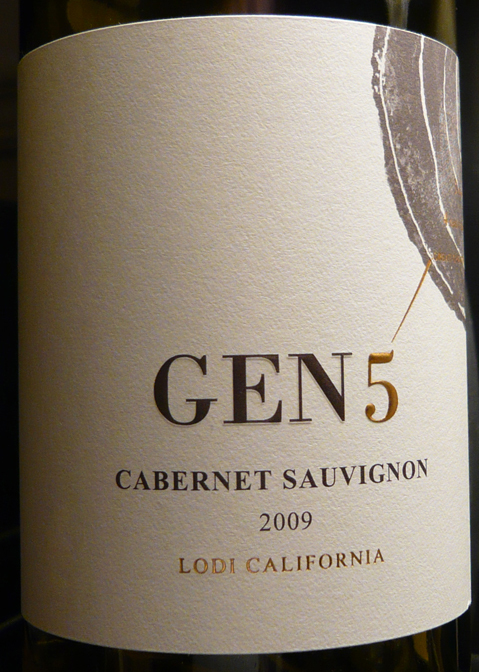 2009 Gen5 Cabernet Sauvignon (85% Cabernet Sauvignon, 8% Merlot, 4% Petit Verdot, 3% Malbec), Lodi, CA. 13.9%, $12. I am fortunate enough to be the Wine Rep that sells Gen5 wines. They are wines I am fond of. Their first releases were the Cab and a lovely California-style Chardonnay. This was followed up only recently with a Merlot (quite nice) and a blockbuster Old Vines Zinfandel. It drinks ‘way more expensive than it costs. I commend it to you; if you like the Cab, you will definitely like the Zin. Russ, this one knocked my socks off. They even put excerpts of this review on their promotional materials! I got a kick out of that. (Wilfred Wong really liked the Cab too.) I would love to try their Merlot and Zin. The Chardonnay was pretty good — I wouldn’t mind having another pass at that as well.